Mendi Mohinder Singh is a classically trained tabla player-composer and a musical visionary with an amazing international reputation. Mendi was born and brought up in Birmingham, UK , and has made unprecedented strides in bringing his instrument to a global audience. From a very young age, Mendi started performing with westernised Asian bands. By the age of eighteen he had completed many successful international tours. Being brought up in a multi-cultural city of Birmingham, his music has been inevitably inspired by the rich and diverse musical styles he has been exposed to and reflects his Birmingham upbringing in his music. Mendi has collaborated with artists diverse as Pandit Shalil Shankar, Peter Gabriel, Darius Brubeck, Anand Shankar, Dave O’Higgins, Courtney Piy, Akram Khan, Kepa Junkera, Dan Crary ,Luis Salin, Ustade Fateh Ali , MBE Malkit Singh. Mendi has been touring for several years extensively with Pandit Shalil Shankar, a senior disciple of the legendary Pandit Ravi Shankar, and together they have performed in prestigious venues and festivals around the Glob. In 2003, the duo, Mohinder and Shalil were invited by the President of Chile to play at a tribute concert for the former President Allende and the much loved folk singer, Victor Jara; they were watched and applauded by over 70,000 people. * In 2004, the duo completed a very successful tour of South America; 18 concerts in Uruguay and Argentina. They were invited by Argentinean’s most loved tango guitarist, Luis Salinas, to perform a concert in the capital, Buenos Aires. * In May 2006 they completed a very successful tour of Mexico, playing in the prestigious venue of Balas Art in Mexico City. His collaboration of tabla and tango guitar playing was loved by all, and they received a standing ovation and great reviews from the press; what is more a beautiful relationship has been built winning the hearts of the music lovers of Argentina. 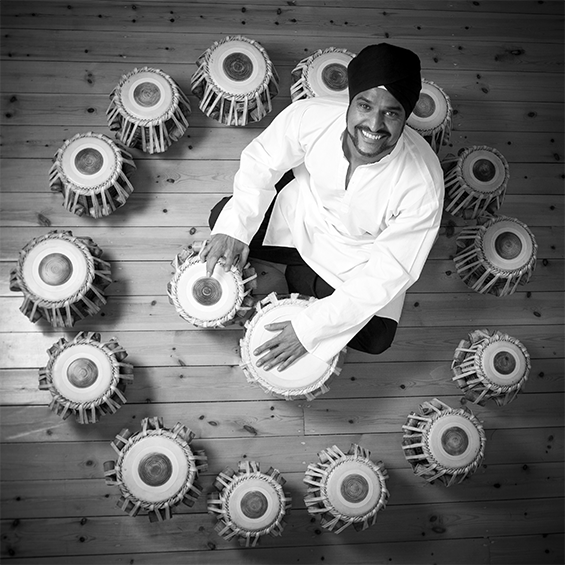 Mendi has travelled the World, expanding and enriching the flavours of his Tabla skills. Mendi’s has been giving master class in tabla and playing with native musicians in Brazil ,Switzerland ,Spain with this inspiration Mendi’s artistic vision was to create the world’s first East-West percussion orchestra featuring Tabla Trang. Mendi rought and performed his table concert for orchestra percussion and table trang.The Premier of the work was performed on 20th Sep 2014 in Birmingham.Mendi named the concert ; United Rhythms. United Rhythm’s Tabla Concerto unites the music of both hemispheres in an entertaining, uplifting and rhythmical spectacle that communicates the elements of Indian spirituality, uniting people with the power of music, sound and vision through a UNIVERSAL language.Producing three original compositions for orchestral percussion, Mendi perform the work with Birmingham Conservatoire’s Percussion Ensemble, drawing on African, South American, American and Arabic styles, written in a Western classical context.